O Lover of mankind, glory to thee. but when he distributed the tongues of fire, he called all to unity, and with one voice, we glorify the all-holy Spirit. 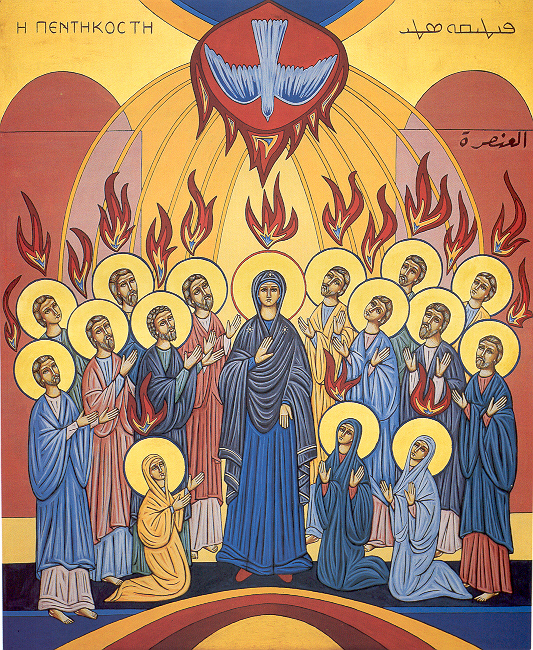 On the great feast of Holy Pentecost, the Church celebrates the ancient, the new, and the continuing manifestation of God in His creation, and also the continuity of God’s action in His world, in the history of His people, in the pouring out of the Holy Spirit upon the disciples (including Mary, the Theotokos, and the women disciples of Christ), and the re-creation and generation of each of us, of one another, and of all the Cosmos. Christ had promised to send The Paraclete to His followers after He had finished His saving work on earth: teaching, healing, suffering, dying, rising again, and then ascending to His Father. The Holy Spirit, of course, had always been in existence, being one of the three distinct but united persons of the Holy Trinity, acting throughout and beyond the aeons of time and space, together with the Father and the Son, “ever existing and eternally the same”. This “Great Fiftieth Day” (the word “Pentecost” comes from the Greek term Pentēkostē, meaning “fiftieth,” and was used in New Testament times to name the feast of the Hebrew people – now known in Judaism as Shavuot– the Feast of Weeks, a feast remembering and celebrating the giving of the Law on Sinai. This festival counted a “week of weeks,” or 49 days, beginning on the second day of Passover (Pascha). The fiftieth day after the rising of Christ from the dead thus corresponded with a holy day in which the special relationship of God with His people was (and, is) remembered each year. The appearing of the tongues of fire descending on the disciples at this time showed that a new covenant, promised by Jesus and by the prophets, a continuation and a renewal of God’s relationship with humanity, was beginning on that day. It is, at all events, possible for us to arrive to a certain extent at intelligent apprehension of the sublimity of His nature and of His unapproachable power, by looking at the meaning of His title, and at the magnitude of His operations, and by His good gifts bestowed on us , or rather on all creation. He is called Spirit, as “God is a Spirit,” and “the breath of our nostrils, the anointed of the Lord.” He is called holy, as the Father is holy, and the Son is holy, for to the creature holiness was brought in from without, but to the Spirit holiness is the fulfillment of nature, and it is for this reason that He is described not as being sanctified, but as sanctifying. He is called good, as the Father is good, and He who was begotten of the Good is good, and to the Spirit His goodness is essence. He is called upright, as “the Lord is upright,” in that He is Himself truth, and is Himself Righteousness, having no divergence nor leaning to one side or to the other, on account of the immutability of His substance. He is called Paraclete, like the Only begotten, as He Himself says, “I will ask the Father, and He will give you another comforter.” Thus names are borne by the Spirit in common with the Father and the Son, and He gets these titles from His natural and close relationship. From what other source could they be derived? Again He is called royal, Spirit of truth, and Spirit of wisdom. “The Spirit of God,” it is said “hath made me,” and God filled Bezaleel with “the divine Spirit of wisdom and understanding and knowledge.” Such names as these are super-eminent and mighty, but they do not transcend His glory. Today, on Pentecost, we again praise and celebrate “God-with-Us”, from eternity, to eternity, the Holy Spirit, in the Unity of the One God in Trinity. Now as in the Upper Room and as throughout the history of the people of Israel and as since before the very foundation of the world, God Is With Us! Psalm 18.4,1: Their voice has gone out into all the earth. On the last day of the feast, the great day, Jesus stood up and cried out, “If anyone thirsts, let him come to me and drink. Whoever believes in me, as the Scripture has said, ‘Out of his heart will flow rivers of living water.’” Now this he said about the Spirit, whom those who believed in him were to receive, for as yet the Spirit had not been given, because Jesus was not yet glorified. When they heard these words, some of the people said, “This really is the Prophet.” Others said, “This is the Christ.” But some said, “Is the Christ to come from Galilee? Has not the Scripture said that the Christ comes from the offspring of David, and comes from Bethlehem, the village where David was?” So there was a division among the people over him. Some of them wanted to arrest him, but no one laid hands on him.